The lush farmlands throughout Escarpment Country™ give us nature’s bounty — some of the best fruits and vegetables in Southern Ontario. Once you’ve tasted fresh-picked — either direct from the grower at a farm market or right off the vine in the field or tree in the orchard — you’ll find it hard to go back to a city supermarket! 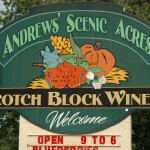 With a scenic view, a beautiful picnic area, a large creative playground, a farm animal corral and free hayrides, a visit to Andrews’ Scenic Acres is a pleasurable family occasion. 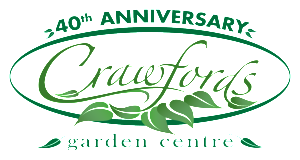 As we are a local destination we have been enjoying community visitors since 1980. From our first day to the present, the number one attraction for our farm has been the nearly unstoppable desire of all ages to hop onto the tractor drawn hay wagon and ride to the field for in season pick your own produce. Our very popular BBQ operates daily during the summer and on Saturdays, Sundays and Holidays during the spring and fall. Available on the BBQ are beef Ball Park hotdogs, Oktoberfest pork sausages, veggie burgers and veggie samosas. Starting in late July or early August, we also have available hot buttered super sweet corn on the cob. Sweet corn grown on our farm is cooked in a turn of the century iron kettle formerly used for boiling maple syrup. There is nothing quite like Andrews’ super fresh, super sweet corn on the cob. Since 1957, we have become synonymus with delighting customers with innovative entertainment farming, apple picking and exceptional bakery products including the world-famous Apple Blossom®. Three generations of Chudleighs have brought apple farming to the mainstream, and we continue the tradition today. Our entertainment farm located just West of Toronto in Milton, Ontario is one of many exceptional tourist destinations along the Niagara Escarpment. Down the road from the Milton farm is our 82,000 square foot bakery, that employs over 150 full time staff and services the grocery and food service industries in North America and beyond. 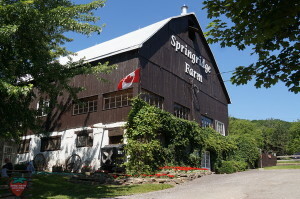 At Springridge our Fun Farm Yard is a safe, educational and fun area for families to explore and play. The Fun Farm Yard experience includes a tractor drawn Wagon Ride. Enjoy the view from the Niagara Escarpment and learn about the farm and the land around us. From April-October, weekend pony rides are available for an additional $4 per ride. Maximum weight 80lbs. Nestled in a picturesque pocket of the Niagara Escarpment in Campbellville, Stonehaven Farms originated in Clarkson, Ontario, in 1904, where six generations of Trenwiths have now been involved in growing and expanding our family farming business. We invite you and your family to come share and enjoy our seasonal Farm Market offering strawberry and pumpkin “Pick Your Own”, exclusively Ontario/local sourced gourmet food items, fresh from the oven bakery goods, soft serve ice cream and more. Participate in entertaining family activities including a ‘Kid Zone’ area, giant corn maze and wagon rides this pastoral setting. Please check ahead for opening/closing dates and times. TERRA’s Winter Market that consists of 50+ vendors in Milton offers a fully enclosed and heated space for the market experience. The Winter Market promotes baked goods, produce, meats cheeses and wind from neighbouring farms and businesses. TERRA decided to start the market in support of local business and farms to increase healthy lifestyles by providing the community with the necessary connection to local food producers over the winter months. The Winter Market also provide social opportunities for people to connect with neighbours, friends and acquaintances in a comfortable and fun atmosphere. At the farm, we provide a fun and interesting learning experience for kids & adults of all ages. 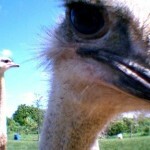 On your educational tour you can view ostrich chicks at one day old (after July 25th), feed the yearlings and say hello to our Rednecks, Bluenecks & African Black adult ostriches. Our tour guides are right there to answer all of your questions and make sure you know everything there is to know about ostriches. Nestled in the foot of the scenic Niagara Escarpment, the Milton Farmers’ Market has been bringing farm-fresh goodness and old-fashioned hospitality to Main Street, in downtown Milton, since 1972. Our farmers proudly display “picked fresh this morning” produce and the streets come alive with artisans and flower vendors. The Milton Chamber of Commerce operates the weekly Saturday morning event from May through October and is one of Ontario’s best outdoor Farmers’ Markets. This years Market will host over 40 vendors on Main Street. Join us for some farm, fresh, fun! Started in 1979, Arbor Garden has been beautifying landscapes in every aspect, from masonry and interlocking, to sodding, garden beds/clean-up, tree planting and removal. We pride ourselves in not only offering a one stop shop for all your landscaping needs, but also in providing the best possible service and quality of work. We opened our doors 50 years ago, beginning with a roadside stand and a concentration on the wholesale side of business. 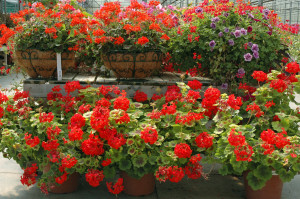 Over the years, we have built a reputation for selling high quality plants at very reasonable prices, with both retailers & consumers alike. Nothing screams Fresh quite like locally grown product. 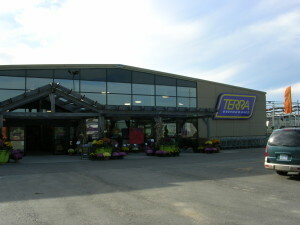 At TERRA we are pleased to bring you thefreshest plant material available straight from our own production facilities right in here in Southern Ontario. 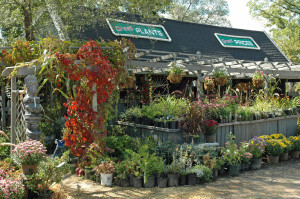 In addition to freshest in plant material TERRA is a contemporary garden centre and lifestyle retaileroffering décor, outdoor furniture and accessories, and fashion.